EMILY is a young female, almost two years old and she is absolutely adorable. 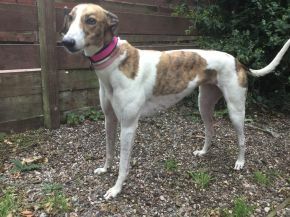 She is white in colour with brindle patches and she has a sweet, docile nature. She has settled well into the sights, sounds and routines of the kennel and she is no trouble at all. She gets on well with other girls and likes to walk with Scarlett, her doggie friend. She is clean in her kennel and is a lovely gentle girl. I’m sure she has a fun nature just waiting to come out with her new family. By showing her fun and affection and giving her new situations, her confidence and personality is sure to grow.